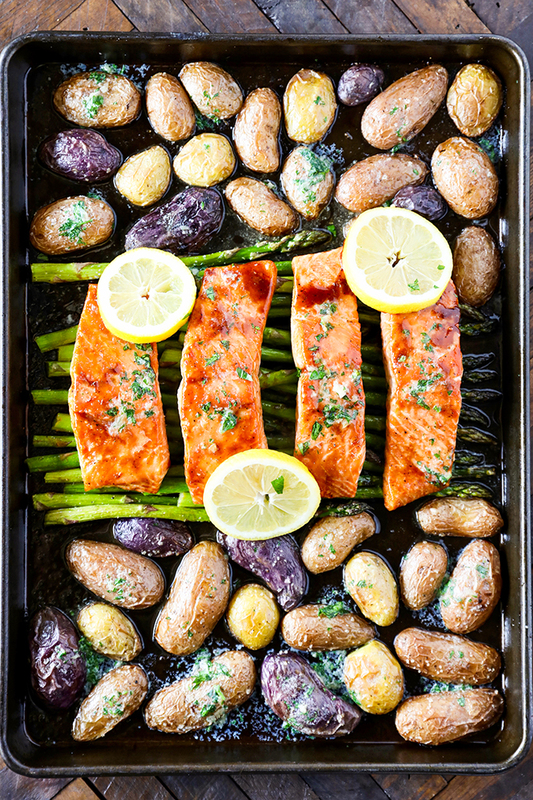 This Sheet Pan Salmon Dinner recipe is so easy to make and absolutely loaded with flavor! 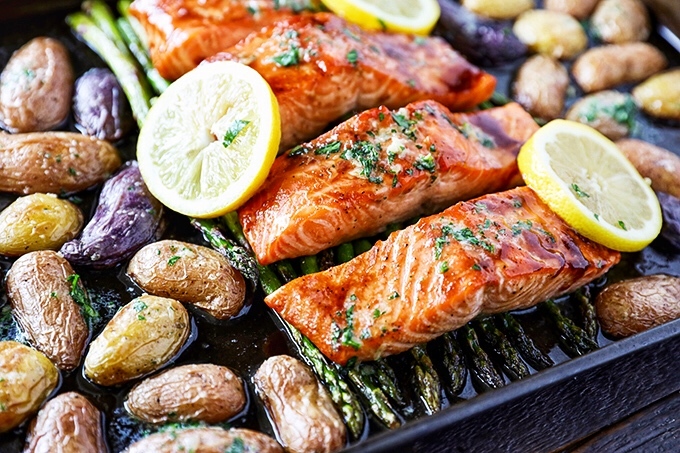 Glazed salmon with garlicky roasted potatoes and asparagus, and everything cooks on the same pan. This is truly the perfect salmon dinner recipe. 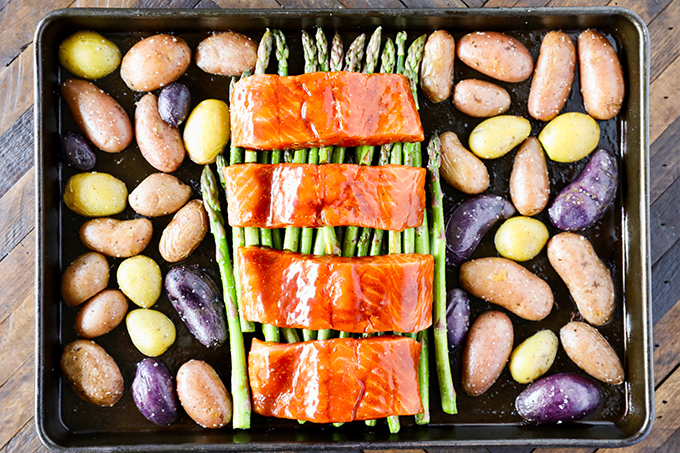 It cooks all on one sheet pan, perfect for busy weeknights but elegant enough to serve company. 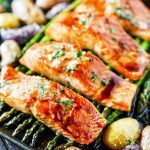 Rich salmon and tender asparagus pair together so nicely, and when you add the garlicky baby potatoes, you have a delicious complete dinner that serves four. 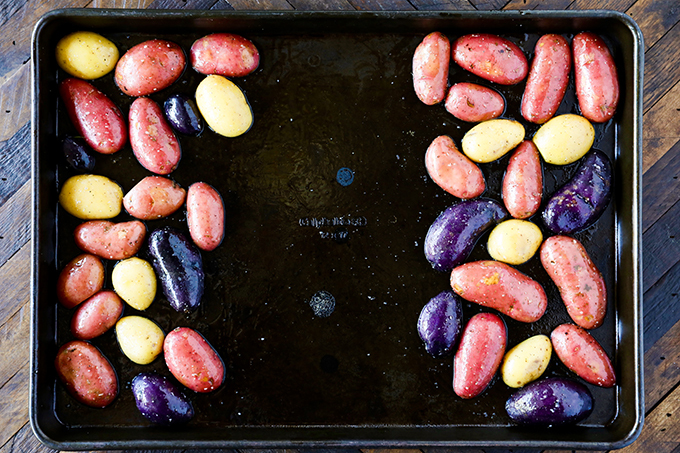 The key to this recipe is giving the baby potatoes a head start on the sheet pan. 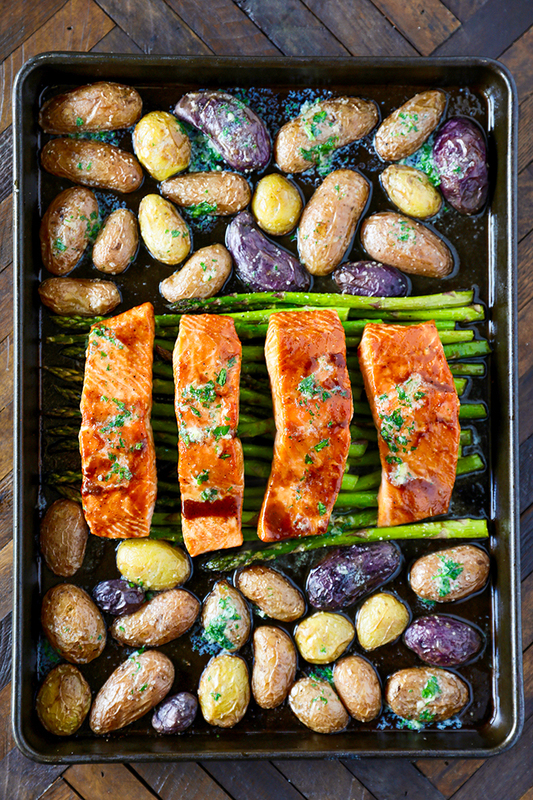 The salmon portions and asparagus will cook at about the same rate, so start with just the potatoes on the sheet pan, then add the asparagus and salmon portions to the hot sheet pan after 10 minutes. The hoisin sauce is a great shortcut glaze for the salmon. It gives it that perfect sweet and salty flavor profile that takes this dish from simple roasted salmon to something extra special. Once the salmon has cooked, the homemade herb butter and squeeze of fresh lemon juice adds so many layers of flavor. For easy clean up, try lining the sheet pan with foil. Cut the potatoes lengthwise so they are thinner and will cook faster. Go for midsized asparagus. Overly thick asparagus will be woody and take longer to cook, and pencil thin asparagus will cook too quickly. 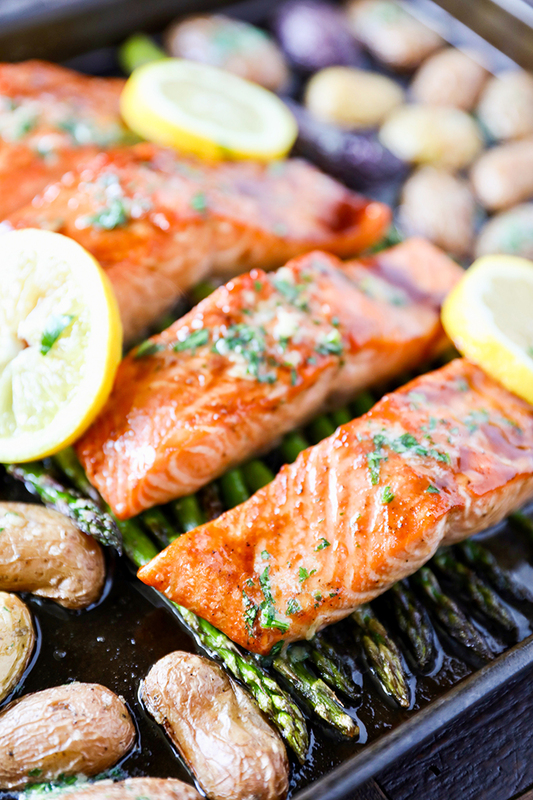 Look for salmon portions that are cut evenly so they will cook at the same rate. Flatter portions from the tail end will cook much more quickly, so cooking times will need to be adjusted. Lower oven rack to middle lower position and preheat oven to 450 degrees. Spray heavy duty baking sheet with nonstick cooking spray. In a large bowl, toss potatoes with 2 tablespoons of olive oil, 1/2 teaspoon of kosher salt, 1/4 teaspoon of freshly ground pepper and 1/8 teaspoon garlic powder. Transfer to baking sheet and arrange on either side of baking sheet, cut side down. Roast in oven for 10 minutes. While potatoes are roasting, combine asparagus with 1 tablespoon of olive oil, 1/2 teaspoon of kosher salt. 1/4 teaspoon of freshly ground pepper and 1/8 teaspoon garlic powder. Season salmon all over with kosher salt and freshly ground pepper, then brush all sides with hoisin sauce. Remove sheet pan from oven after 10 minutes and add asparagus to center of sheet pan. 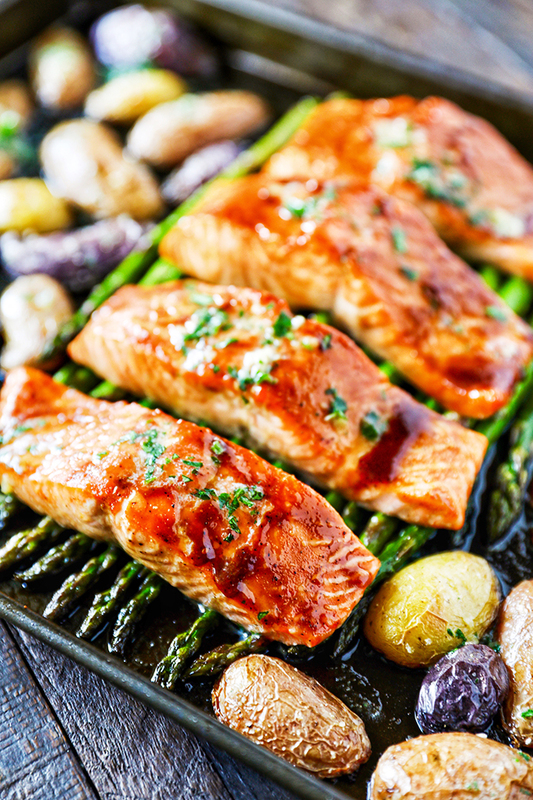 Arrange salmon portions, not touching, over asparagus. Roast for another 10-15 minutes depending on thickness of salmon portions and size of asparagus. While salmon is cooking, combine butter, parsley and garlic. When salmon is done cooking, remove sheet pan and top each salmon portion with 1/2 tablespoon of garlic herb butter then top with a squeeze of fresh lemon juice. Top potatoes and asparagus with remaining two tablespoon of garlic herb butter and serve.